RedX Review 2019: Is RedX a Good Hosting? RedX is an Israeli hosting vendor backed by some of the most experienced web hosting professionals in the country. The website hosting company’s exceptional success through the years can easily be traced to its high-quality support services, unmatched by any other vendor in Israel. 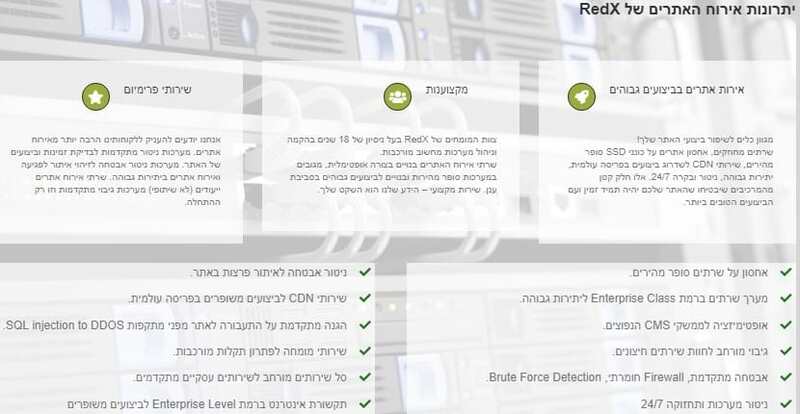 For over 18 years, RedX, an Israeli website hosting vendor, has been the go-to hosting solutions provider for many people and businesses in Israel and beyond. Over the years, the company has gained a reputation as a one-stop hosting service provider for those who want a simplified solution for their websites. The RedX website is only available in Hebrew. Comprehensive one-stop shop – RedX is designed by some of the most experienced web hosting professionals in Israel as an all-inclusive, hosting solution for businesses whatever the size. The solution is flexible enough to align with the particular needs of any user. Round the clock service monitoring – RedX hosting solutions include operations services designed for critical systems as well as round the clock services monitoring. The vendor has system experts keeping tabs on every aspect of the servers to ensure that any critical issue is identified and dealt with to avoid system malfunctions. RedX offers reliable and robust hosting solutions backed by powerful servers in data centers across Israel. The cost of RedX hosting plans is within reason, especially given the many features you get with each plan. Indeed, I found that RedX hosting prices are pretty much the standard prices you will get for website hosting. RedX has no money-back guarantee, no free hosting package, and no free trial period for any of its hosting plans. That said, it has thousands of satisfied customers who would vouch for its hosting solutions. The RedX support team ensures that you receive satisfactory answers to every question you ask about its hosting plans. It is available 24 hrs a day, 7 days a week. The company also offers VIP customer support, full end-to-end support for any of their customers who need it as well as round the clock personal support services. These premium support services are quite unique and have long made the company stand out among the industry’s leading hosting vendors in Israel. What’s more, this support team is professional and has a fast response rate. To get in touch with RedX customer support, you can use their live chat feature, give them a call, chat with them on WhatsApp, use their customer service portal, or send them a message via their website contact form. In my experience, RedX support team delivers the premium support services that it promises its customers. The support team responded to my email in under 10 minutes and the live chat was practically instantaneous. RedX has been dominating the website hosting space in Israel for over 18 years. The company is best known for its premium customer support and outstanding hosting solutions at competitive prices. Wondering how RedX stacks up against other Web Hosting companies? Enter any other Web Hosting company and we will give you a side-by-side comparison.